Welcome, Teachers. We have sought to bring you a wealth of resources on the Caddo Indians that may be explored by you and your students. As a first step, you may choose to look through Caddo Fundamentals. This set of "exhibits" provides a broad overview of the Caddo people, their homeland, languages, and the larger sphere of influence in which they operated. You may also want to review the children's activities created specifically for this exhibit and correlated to the teacher's resources. Entitled World of the Caddo, this highly interactive set of colorful exhibits includes Mounds of Mystery, Explore a Caddo Village, Meet the Caddo People (past and present), Build a Caddo House, and Traces of the Past, a "virtual museum of amazing objects created by the Caddo. The latter section also provides insights in how archeologists study the ancient Caddo in "Searching For Clues." The first of two lessons on the Caddo, Making a Caddo Circle Book, was created by TBH Educational Consultant Dr. Mary Black. In this innovative lesson, students write, draw, and use mathematics to create a short booklet about the Caddo Indians. Addressing numerous objectives of the Texas Essential Knowledge and Skills, this interdisciplinary lesson is suitable for grades 4 and 7. It is presented in PDF format for easy downloading and printing for use in class. Download lesson plan. 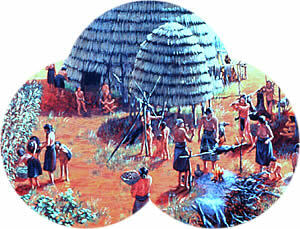 The second lesson on the Caddo is aimed at high school history students. Who's Buried Where - And Why? Finding Cultural Universals with the Ancient Egyptians and Texas Caddo, was created by TBH Educational Consultant Carol Schlenk. This lesson illustrates that certain human values and practices do not change over time or with location. Cultural universals are the basic behaviors practiced by all cultures, regardless of location or era. Studying cultural universals helps us understand the customs of other societies both historically and in today's multicultural world. Humans burying and honoring their dead is one of these cultural universals. In this lesson, students will discover that burial practices of the Caddo Indians in east Texas around 1000 years ago and those of the ancient Egyptians over 4000 years ago, had a number of interesting differences and similarities. Addressing numerous objectives of the Texas Essential Knowledge and Skills, this interdisciplinary lesson is suitable for high school levels. It is presented in PDF format for easy downloading and printing for use in class. View TEKS and download page. Please review and enjoy these resources and, as always, if you have questions, suggestions, or comments, feel free to contact us via the Teachers Feedback form included with the lesson plans.